Tatting is on hold as I work on afghans for Christmas presents. Lily's is a nice lap size now, but I really want it to be a little larger. I know I have enough yarn for one pattern repeat, but I'm hoping for two. I do like the way the colors flow with the Mandala yarn! Have I told you how much I love lighthouses? I just couldn't resist this beauty from Grizzly Mountain Arts! There was another lighthouse shuttle listed, but some lucky shuttle collector snapped it up before I could even see the listing. That's okay. I was able to get one lighthouse to add to my collection, and that makes me happy! 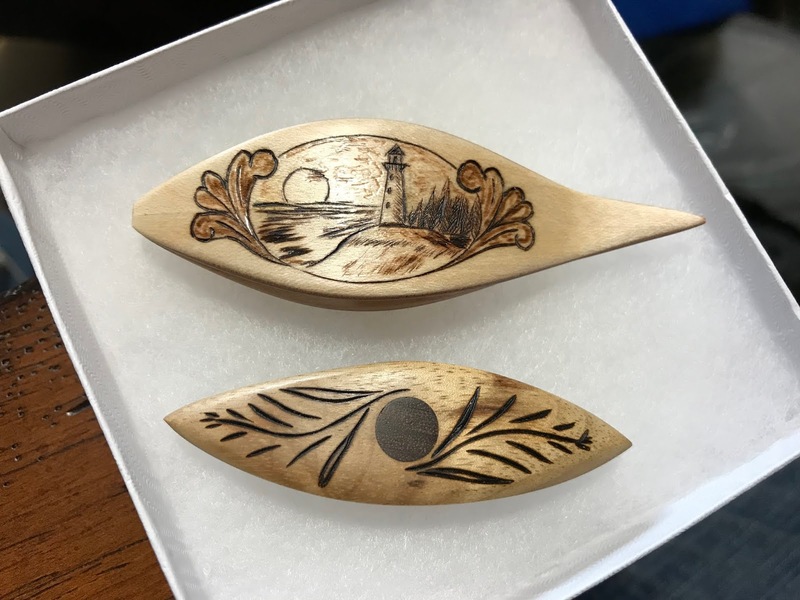 I'm a big fan of Dave's shuttles, and I love his pyrography! Some of the high school girls are fascinated by Mandy Kerwell-Bez's tatting. Mandy tatted a beautiful necklace for me, and I'm going to try and follow her lead to make necklaces for the girls. It was very difficult to choose Swarovski rivolis for the girls to choose from! I'll be taking these to school tomorrow, along with threads, so that the girls can make their choices. I've already warned them that they probably won't get their necklaces until after the holidays. I have way too much going on right now! Is that Mandala yarn like sock yarn? It’s dyed that way? I can’t wait to see these necklaces you make for the girls. Mandala is a sport weight yarn. I don't think it would be suitable for socks as it is very soft. Yes, the yarn is dyed that way. 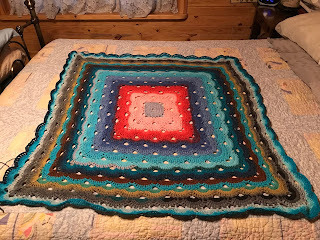 I've actually used three different colorways for this afghan. I like the variety! I'm eager to start the necklaces for the girls. 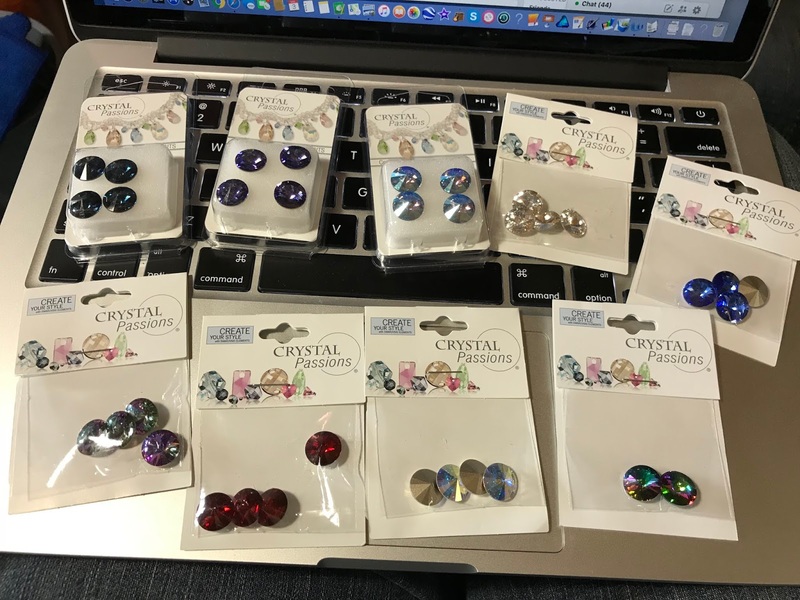 Those Swarovski crystals are calling to me! This afghan is just beautiful! Hope you achieve your goal of the final rounds! I am amazed at your speed (and the strength of your wrists). The color blending is fabulous and I still don't understand how it works out so perfectly to form the rectangles, no matter what the pattern! You also seem to be working full time again! So nice to know that teenagers have an interest in your tatted jewelry! Do they realize that you started this whole craze? I would hesitate to take orders, but I know you will fulfill them! And your shuttle collection has to be the all-time world record! One has to be fast to even see the Grizzly Mountain shuttles when listed! Glad the shuttles are so popular, as their work is very unique. My friend Denise tells me that these multi-colored yarns are all math-based. Math baffles me, so I don't try and figure it out. I just crochet/knit/tat and hope for the best! Since the necklace are basically fancy Ice Drops, I have no problem tatting for these girls. I've known several of them since they were in kindergarten. We have a special bond! Yes, I've told them about the Ice Drop Addicts page on Facebook, and we've looked through the photos there. The girls were in awe!